Smartphone - Download photos from your Smartphone and share with your loved ones. Digital Camera/Video - You will need to reference your digital camera or video camera to get direction on downloading images to your computer. Photo CD - when you take your film to be processed, KODAK offers a Photo CD for an additional fee. If you don't have a Digital Camera or a Scanner, then this is your best option. Scanner - for the more advanced user, you may have a scanner where you can scan in hard copy photographs. Be sure to organize and backup your images on your computer. 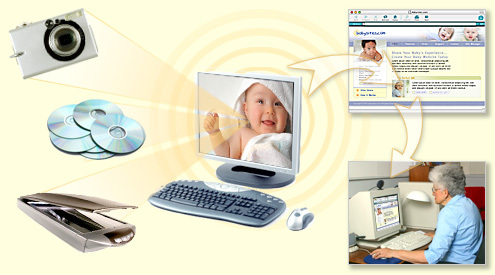 Go to www.babysites.com/admin/siteMgrLogin.asp to login to your Babysite Site Manager. Either add the photos/video/audio to an existing album or create a new album for a special occasion. When you upload photos, we resize your large photos to approx 50KB (500 pixels wide). This allows you to store more photos on your babysite. Once you have updated your Babysite, send an email notification to all of your family and friends instantly from your Site Manager. You can maintain an email address book within your Site Manager.